This is one of the most profitable ways to monetize your blogs, as you get to keep 100% of the profits. You can sell these products directly from within your blog content, in your sidebar, and using other ads sprinkled around your blog. If you are already teaching people with the content on your blog, then you might consider setting up a course and put all of your information in one place for your readers, and charging a nominal fee for it. and sell courses for different price points. You can also promote beginner, intermediate and advanced courses, to appeal to a variety or students. Because you are creating and offering your own products, you control everything. How much to sell the product for, whether to offer a trip-wire product, and when to increase the price. It is all in your hands. so it is a good idea to start with an ebook or small course first and see how successful it is. If you offer a beta test with your course, you will get valuable feedback from the participants and can tweak your course, adding or removing content. You can also have other people be your affiliates and they will promote your course for you. This is the number one way that successful bloggers are earning steady, full-time income. Udemy has regular sales on their courses, many at $12.99 each. Udemy is also an excellent place to sell your courses and earn passive income. Check out the courses that you are interested in and see if there are any free ones! If you are on my mailing list, I often send links to my subscribers when I find free courses or offerings on products that I think my subscribers might like. Just fill in my opt-in box at the top right of this page and get in on the free stuff! Another option is to be a coach. If you know a lot about one subject and feel like helping others to learn what you know, you can promote your services in many ways: online, phone calls or skype, or in a membership area of your website set up for this purpose. You can offer different time increments, depending on the situation, or just stick to a pay-by-the-hour service. You can write blog posts and promote your services, have ads in your sidebar or announcement bar, and invite people in your email newsletter. Where someone will assess your profile and pins and offer suggestions for improvements. Many people do not mind paying extra to get to the front of the line and get an answer to their questions. People want to learn how to overcome their issues. They want the help that one-on-one coaching can give them and the personalized attention. You will also gain some clients that will stay loyal and come back for more. Going along with coaching is freelance work. If you have a skill, like a good knowledge of Pinterest, you can easily freelance as a Virtual Assistant while you are monetizing your blog or website in other ways, creating multiple streams of income. Virtual Assistants are hugely popular right now as busy bloggers and website owner’s contract out tasks that they do not have time for. If you have the skills that they need, you can earn money working for other people. And as you learn how to solve other people’s problems, you will gain tons of new blog content ideas! -Content Creation, including creating pins using free tools like Canva. You can charge anywhere from $20 an hour up to $100 or more depending on your skill level and the client’s needs. 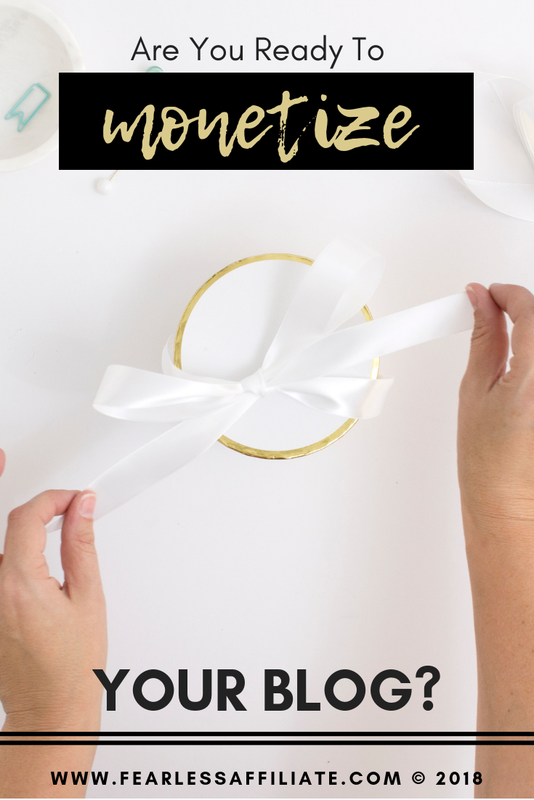 Selling affiliate products is by far the easiest way to start monetizing, and my personal favorite because you can start, almost immediately, to monetize a new website or blog. You can sell both physical (Amazon products) and digital products (Clickbank, ShareAsale, CJ Affiliate products or blogging bundles), although digital products tend to have bigger commission rates. You can sprinkle ads throughout your blog, as well as posting direct promotions, case studies and other content on your blog. Depending on your niche, you can promote a variety of products for the different “pain points” of your audience. For example, if your website is about a specific breed of dog, you can offer products like training guides for puppies, tricks for grown dogs or caring for senior dogs. It is a good idea to try out some of the products that you promote, and then write up a good or bad review of the product, being honest and explaining how you used the product and the results that you got. These reviews are helpful to other consumers who are researching these products and can help to bring more traffic to your website if they are shared by happy readers. The other great thing about affiliate marketing is that even if products come and go, there are millions of other new products being created that will take their place. Win-win! Related Post: Earn Money Writing Reviews! 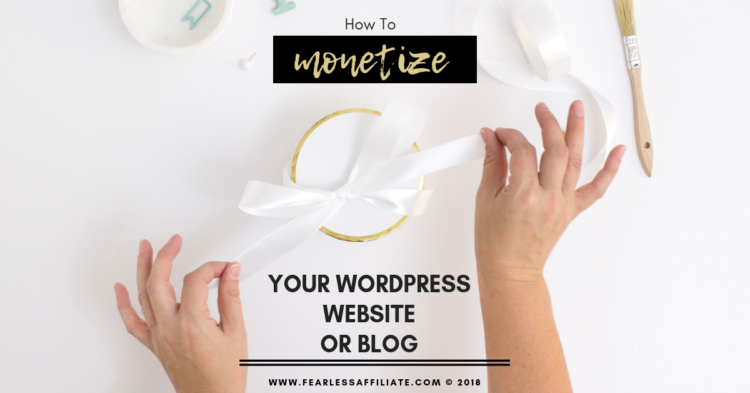 Are you interested in which WordPress plugins can help you monetize your blog? My friend Ben who blogs at Breaking The One Percent has an excellent article that can help you with this. Ads are an easy way to see the power that your website traffic generates. New bloggers can usually be accepted to Google AdSense or Media.net right away. Just put an ad in your sidebar, one or two in your footer and maybe one in between paragraphs in your blog and then monitor the results. Some ads are Cost-Per-Click, meaning a visitor has to click on something for you to get paid. Some are Cost-Per-Mille, which is payment per 1000 views. You really have to look around at the options that are best for your niche. They can slow down load times and too many ads are annoying and make for a poor visitor experience, meaning people will not return. You know what I mean right? You click to go to a website and it takes 45 seconds to load because there are so.many.ads. Annoying. Just test out one or two spots first, then if it looks like it is not causing problems for visitors i.e. high bounce rate, consider adding another one or two. This is a great way to see how website advertising works. Some people swear by Google AdSense as a great form of passive income, while others never reach the payout threshold. Every niche website is different. When you reach 25,000 Google Analytic sessions (pageviews) in a 30 day time period, you can apply to a larger ad network, Mediavine. you can apply to AdThrive. This is the goal for many bloggers that I know, as the income from ads lets them back off from time-consuming blog content creation and frees up time for creating courses or ebooks. And if you are applying to these bigger ad companies, that would be the time to consider ditching some of your smaller ad networks to speed up your load times. Ad income should be considered passive income and not something that you want fully funding your website forever. You do not have a lot of control with ads, meaning that payment criteria can change at any time. Or the ad companies can change how much they take on their end. No matter what monetization method you choose, it’s a good idea to build a mailing list. That way you can follow up with your prospects again and again to sell targeted offers. You can read the tales of countless 7K bloggers who regret not starting email marketing sooner. Which is a shame, because it is so easy to get set up to capture email addresses. The other huge benefit to email marketing is that the people who sign up want to be there. They are interested in what you have to say and the things that you are offering. Your subscribers want to be in your sales funnel and they want your help. The sales funnel goes like this: people opt-in to your email list from a box on your website. You usually offer a free product – something that goes along with a blog post like a checklist. After they opt-in, you send a welcome series of emails to introduce yourself and what you are offering. with offers, both free and paid – your ‘backend’ offers. Your subscribers can pick and choose what offers they will click on. This creates a give and take relationship, where everyone wins. You can create as many funnels as you want. Once they are set up and functioning, you will be earning you money on auto-pilot…a bloggers dream! I was shocked after I set up email marketing and got 28 sign ups in the first week. People were waiting for me to put that opt-in box on my website! They are waiting for you as well. So, which of these monetization methods is right for you? The truth is, selling your own products will almost always be more profitable than any other method mentioned. And you can certainly combine methods, such as selling both your own products and affiliate products. Test out a variety of these methods. See which ones produce the most profits for your particular blog. Still on the fence about starting a blog? 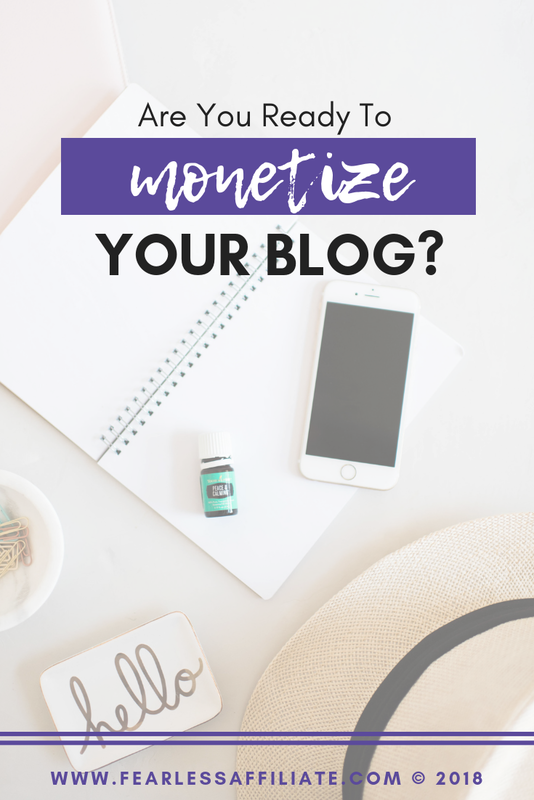 Not sure if a blog is the way to go for you but you still need some extra cash? Or just need some extra cash? Related Post: 5 Ways to Make $500 a Week! I hope you enjoyed this post and will share it with others who can benefit. Be sure to sign up for my weekly newsletter of special offers, freebies and exclusive content. All of these sound great! Starting an email list is definitely key because you establish trust with a customer base that you know is interested in your content and products. I’d love to get into coaching as well – thanks so much for sharing! That is awesome Will and I wish you much success!